Most of us have been through the cycle before. You’ve come to realize you need to start working out regularly in order to get healthier. Your new workout plan is going great for a couple of weeks when suddenly – WHAMMO – something starts hurting that didn’t hurt before you started. 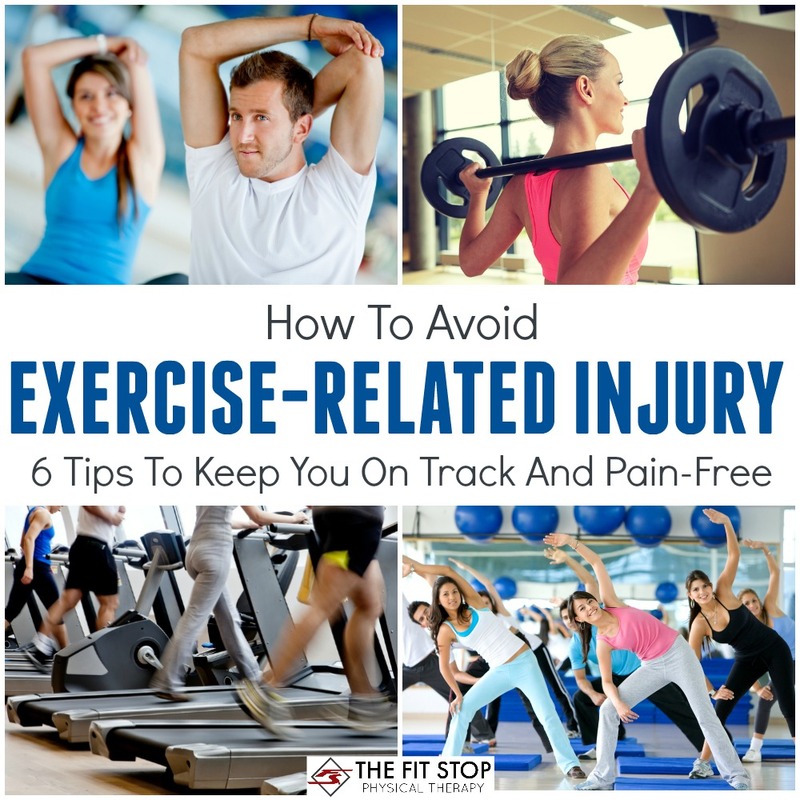 You take some time off rehabbing this injury and after a couple of weeks it starts to feel better, but you fail to pick up your fitness routine where you left off. Suddenly you’re back to your same old ways – thinking maybe one day again you’ll try working out. 1. Avoid repetition/overuse – Ah – the overuse injury. This is probably the most-common type of injury we see. Whether it be running, lifting weights, or even home routines – people tend to get stuck in a pattern when exercising. Do you jog the same route multiple days in the week? Do you lift the same muscle groups on the same days (Mon is chest day, Tue is leg day, etc)? Or do you even do the same workout video day in and day out? You have to add some variety to your workouts to give your muscles a break and allow some time for recovery. Try supplementing your running with strength training. Do heavy weeks and light weeks in the gym with your weights, or mix up strength and cardio days. Try yoga, pilates, HIIT, Zumba, Crossfit to mix up your “normal” exercise routine. Adding variety to your workouts is a great way to avoid overuse injuries. 2. Use proper form – Hear me now and remember it always: form trumps reps and resistance EVERY SINGLE TIME. I don’t care how much of something you can lift or how many times you can do it – if you’re performing exercises with poor form you’re A) not getting the maximum benefit out of your workout and B) eventually going to hurt yourself. Form is crucial, yet it seems that no one ever really talks about it. If you ever want advice as to what proper form is on any given exercise come and let us know! One of our PT’s would be glad to help you ensure your form is correct. 3. Don’t forget the stabilizers – This is one of the most-common problems that I run into with individuals who exercise regularly. Often people will train large muscle groups – their shoulders, their quads, their chest, their arms… while neglecting some of the smaller, more essential groups necessary for proper movement and mechanics. These include the rotator cuff in the shoulder, the hip abductors in the legs, and the spine/core stabilizers in the lower back (just to name a few!). 4. Warm-up, cooldown and stretch – All-too-often people jump headfirst into a workout without taking the necessary time to warm-up first. Warming up ensures that there’s some blood flowing to your major muscle groups and promotes some elasticity in the muscle (leaving it less susceptible to tearing). Here’s a great shoulder warm up you can do before any upper body workout. Cooling down and stretching are essential parts of the post-workout process. A proper cool down ensures your heart rate and blood pressure return to a normal level while stretching helps to mitigate any soreness you may experience following your workout. Here are some great stretching ideas for your arms and for your legs. 5. Lift weights with a friend – Enlisting the help of a buddy can be an excellent, safe way to push yourself further then you could have otherwise. Having a spotter present during your workout not only gets you 1-2 more reps per set, but he/she can also offer meaningful encouragement. Here is a great list of workouts you can do with your buddy the next time you’re in the gym! 6. Listen to your body – Finally (and might I add most importantly) make sure you are in tune with what your body is telling you. YOU will always be the best indicator and greatest predictor of whether or not you are exercising appropriately. Muscle soreness and fatigue following a good workout is an indicator that you are on the right track. Keep going! However, sharp pain with certain movements, throbbing pain radiating from one specific location, and pain that lasts for more than 2–3 days or increases in intensity are all indicators of a more serious underlying problem. If you experience any of these it might be a good idea to lay off for a while; my recommendation would be consult with your physician to make sure you are not dealing with a more-serious problem. Following these six guidelines is a great way to ensure a lifetime of healthy, active exercising. Try them out today, and see how far you can take your results! Of course if you have any questions concerning any of the tips we’ve presented in this post we would be happy to help you out! Leave us a comment below or you can drop by any one of our 4 convenient locations and ask us your question. Can physical therapy help me avoid surgery?